This clichéd romantic comedy stars Simon Pegg as Dennis, a man who literally runs away on his wedding day to his pregnant wife Libby (Thandi Newton). Fast forward five years later and Dennis' life has gone from bad to worse as he now works as security guard in a women's lingerie store. To compound the situation, his ex-fiancé Libby has met a new man called Whit (Hank Azaria) who threatens to take his dream woman away from in and also the affections of his son. To Dennis, it appears Whit is the perfect the man, however as he attempts to become more involved with his son, he soon learns that Whit is not all he adds up to be and Dennis decides to compete in the same marathon as Libby's new partner in an attempt to gain her affection again. 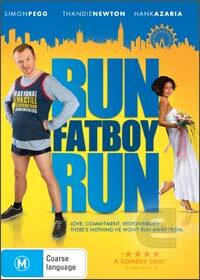 Directed by David Schwimmer, Run Fatboy Run is quite a clichéd movie that although is enjoyable, it has a few laughs, however is a little too mainstream for Simon Pegg. Not even his entertaining "looks" and acting ability can save David Schwimmer's movie. Although the video and audio quality is quite impressive and clear on DVD, where the DVD does shine is through some of the special features, especially the goof reel and outtakes. A great movie for couples for those cold nights in!